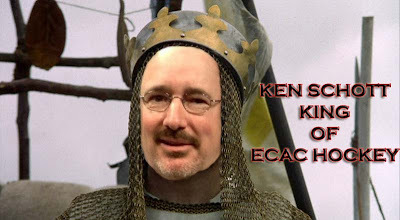 We had the opportunity recently to (virtually) sit down with the King of Schenectady, the Duke of the ECAC media, Daily Gazette writer Ken Schott. We forgot to ask him if the rumors of an upcoming steel cage match between him and Ed Weaver were true, but we did discuss a number of burning questions that we think you'll find intriguing. Without A Peer: Most obvious question first - what's your take on Appertgate? Was he right to be that blunt? Ken Schott: If you're a Union fan, you may think Seth was being a sore loser. But in this day an age when coaches and players are guarded in what they say to the media, I found it refreshing. He believes in his team, which is much improved over the last couple of seasons. So, I don't have a problem with it. Plus, it spices up the rivalry with Union. WAP: A lot of RPI fans don't think there was a "real" rivalry with Union before this year, and that's starting to change. Were they right? KS: I think a lot of them still look to Clarkson as THE rival, especially with the last-minute-of-play chant. They looked at Union as some wannabe Division I team that didn't offer scholarships and weren't going to be competitive. But with Union taking control of the rivalry the last few years, I think the RPI fans are slowly starting to come around to that. Plus, Seth has been a big believer in this series being THE rivalry, and he has instilled that in his players. Also, the fact that the first three games between the two teams this season were classics, that only enhances it. WAP: Couldn't agree more. Quinnipiac - are they in a slump, or is this a regression to the mean? No one thought they'd be anywhere near where they were at the end of November. KS: You can't really complain about the goaltending. Dan Clarke has been good. Bud Fisher was OK, but I was never impressed with him. 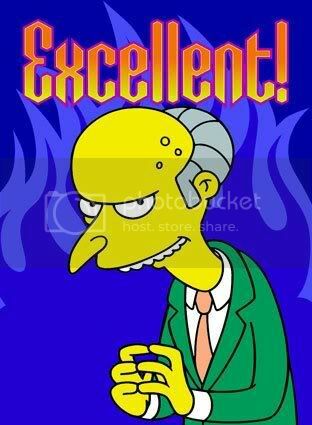 The Bobcats' scoring has tailed off the last four games. That has hurt them. WAP: Clarkson's never finished in last in the ECAC before, but they're in danger this season. Is George Roll on thin ice? KS: You would hope not. But knowing how fans and alums can be, they may put pressure on the Clarkson administration to make a change. I have never seen a Clarkson team struggle like this in my 19 years of covering college hockey. WAP: You'll excuse Engineer stalwarts, of course, if they suppress a giggle. WAP: Jerry D'Amigo's not a likely candidate to see his senior year in Troy. Over/under two full seasons in an Engineers sweater? KS: Push. Just two seasons. KS: Over. 3 seasons. Of course, a lot depends on (Chicago's) cap situation. WAP: Buy or sell Chase Polacek as a flight risk? WAP: Even if he, say, was a Hobey Baker finalist, the way Marc Cavosie and Brad Tapper were before they split town? KS: The offer from an NHL team would have to be really good. Leaving early and getting the money doesn't always mean success at the next level. WAP: Not that I'm trying to change your mind at all, of course. So you suspect that RPI's "Big 3" this year will all be back next season. Any word on how firm Jacob Laliberté's likelihood of joining them is? KS: I suspect they will, and Jacob will be there. WAP: Excellent. So, the Capital District - most feared weekend in the league? KS: It is this year. No one likes to play at Union because it is cramped, and Union always plays physical. With RPI getting better, it makes it even a more difficult time for the opposition. WAP: It's not too much of a stretch of the imagination to call this the greatest season in the history of Union hockey, no matter what happens from here on out. Any of their guys have a good shot at earning an NHL callup in the near future? We've got a healthy respect for Mario Valery-Trabucco's skills at Without A Peer. KS: You have to give Mario and Jason Walters at least a shot of making it to the AHL. Kelly Zajac and Adam Presizniuk could have a shots. KS: Definitely AHL. With Zajac having a brother in the NHL, he could get a closer look. WAP: Sounds good. We continue await your eventual arrival on Twitter. KS: Still thinking about that. We think Ken will eventually be tweeting with the best of 'em. Call it... Peer pressure. We also promised Ken that there'd be no lame photoshops to go along with this interview - so here's an AWESOME one instead! Thanks to Gross Misconduct Hockey and Hockey Joe for the uber-sweetness.